I hope you are having a very creative week. I am not having a bad one but it is not super great either haha. Last week I managed to make this tags but I didn't have the time to write any posts until now. For this tags I used one of my clear stamps called little bird. It is a new baby stamp but the image in digital I call it Easter bird. 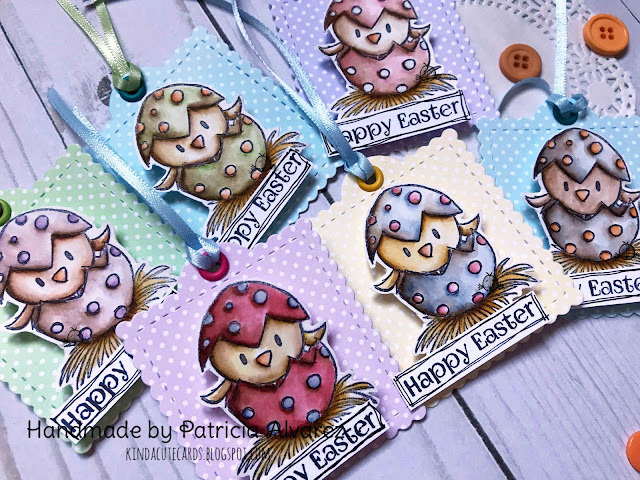 So now that Easter is coming I mixed the little bird clear stamp with the Easter girl clear stamp set and I made this tags. I also used some patterned paper from my shop. You can find it here. I colored the chicks with distress inks. The good think about this kind of "messy coloring" is that it doesn't take me too much time (plus the image is not too big), so I managed to get the tags done in a timely manner. Here I show you some of the color combinations that I used for the birds ;). Also, this week I am having a digital sale at my shop. I had a problem last weekend and I had to deactivate the instant downloads and start sending them by email agin. So I have a 50% off on digital products until the end of the week when you use the code MAR50 during check out at kindacutebypatricia.com. The shop is open internationally so...everyone can use the code. The coupon is not for the Etsy store, but you can get the instant downloads there if you prefer. Thanks for taking the time to see my post!